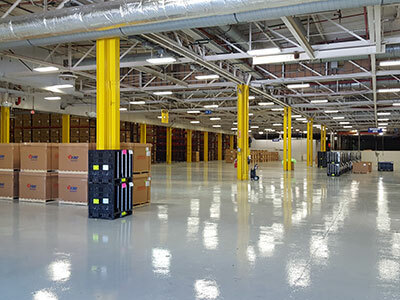 With more than 40 million square feet of industrial space in three states, our clients are commercial and industrial companies searching for unique and creative real estate solutions. We buy, renovate and manage real estate properties in order to help our clients reduce operating costs, improve efficiency, boost productivity and improve profits. While we take pride in seeing our clients grow, we also value the impact we have on local communities. We are truly economic development partners for the communities in which we work. In many cases, Industrial Commercial Properties takes old, dilapidated properties and transforms them into facilities that communities can be proud of. These reinvented buildings provide effective work spaces for our clients and points of pride for the towns that house them. Our renovated real estate becomes efficient, environmentally friendly and beautiful. The growth seen by our tenants provides new jobs and taxes for the community. And these flagship properties help attract even more businesses, creating additional economic opportunity for the city and surrounding areas. We’ve renovated properties that would have otherwise been nothing but blight, and in doing so, have helped create more than 1,000 jobs in multiple communities. For example, the former GM Plant in Moraine, Ohio, which is now home to the world’s largest auto glass maker, brought over 2,000 jobs back to the Dayton area.